>The episode aired last night. Jonathan works with GLSEN and has done amazing work raising awareness of the need to make schools safe for all students. The GLSEN Respect Awards - Los Angeles are October 9. GLSEN is honoring HBO, David Bohnett, Shonda Rhimes and our Student of the Year. ET's web story on Jonathan is here. >Today, a GLSEN student advocate and his parents spoke directly to the President and First Lady, asking for their support for all students around the country who are afraid to go to school each day. Just months ago, Conrad Honicker faced death threats from classmates at West High School in Knoxville, TN, for being out and for being an advocate for change. Today, he and his parents stood in the White House's Blue Room with the President and Mrs. Obama, asking them to be a visible allies for LGBT students. Learn more about Conrad's experiences in Knoxville here and here. 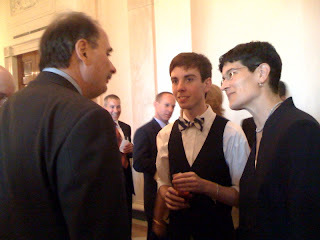 GLSEN Executive Director Eliza Byard and GLSEN student leader Conrad Honicker talk safe schools with David Axelrod, Senior Advisor to President Obama, at today's LGBT Pride reception at the White House. >In the Life's latest episode, airing on PBS stations across the country, takes a look at the LGBT movement 40 years after Stonewall. In the segment below, In the Life examines what it's like to be an LGBT youth today. As GLSEN founder Kevin Jennings says in the piece, "2009 is the best of times and the worst of times to be an LGBT youth." If you're interested in research on what LGBT youth experience in school, check out GLSEN's 2007 National School Climate Survey. >During last night's "Real Housewives of New Jersey" reunion show part 1 (viewable here), the wives discussed the use of the term 'that's so gay' by one of the husbands in an earlier episode. We want to first commend Danielle and host Andy Cohen for pointing out what 83.1% of LGBT (lesbian, gay, bisexual and transgender) youth told us in the 2007 National School Climate Survey of more than 6,000 LGBT youth: 'That's so gay' is offensive. The 83.1% of LGBT students said the term caused them to be bothered or distressed to some degree. Oh, and by the way, 99% of LGBT students had heard the term in school. As the Housewives themselves pointed out: it's everywhere. But that doesn't make it OK to say. GLSEN has partnered with the Ad Council to educate teens, many of whom use it without even realizing what they are saying (that gay=something bad), about just how offensive the term is. The campaign is called Think B4 You Speak and features TV PSAs with Hilary Duff and Wanda Sykes. The spots can be viewed at http://www.thinkb4youspeak.com/. You may have seen them airing around the country (or referenced by Dane Cook in his stand-up routine). So what's wrong with the term? Well, aside from the fact it's demeaning, such language is pervasive and fosters a hostile climate for LGBT students and those perceived to be LGBT. Nearly 9 out of 10 LGBT students said they'd been harassed at school in the past school year, and 60.8% said they feel unsafe at school because of their sexual orientation. Imagine if who you are were used as an insult. When you say "that's so gay" do you realize what you say? Knock it off! Check out Andy Cohen's blog about the show. NEW YORK - The North Carolina House today sent an anti-bullying bill with enumerated categories including sexual orientation and gender identity to Governor Bev Perdue. If Perdue signs the law, North Carolina will become the eighth state to implement an anti-bullying law that includes protections based on sexual orientation and gender identity. Oregon became the seventh state last week. GLSEN commends the efforts of Equality North Carolina and all North Carolina advocates for bringing the state one step closer to making sure all students are safe in school. GLSEN, the Gay, Lesbian and Straight Education Network, is the leading national education organization focused on ensuring safe schools for all students. Established nationally in 1995, GLSEN envisions a world in which every child learns to respect and accept all people, regardless of sexual orientation or gender identity/expression. GLSEN seeks to develop school climates where difference is valued for the positive contribution it makes to creating a more vibrant and diverse community. For information on GLSEN's research, educational resources, public policy advocacy, student organizing programs and educator training initiatives, visit www.glsen.org. >eHuge victory in North Carolina tonight. The House gave initial approval to the School Violence Prevention Act, an anti-bullying law requiring school districts to implement anti-bullying policies that enumerate categories often targeted by bullies, including sexual orientation and gender identity. The bill has already passed the Senate. The House will vote one more time, possibly as early as tomorrow. If the bill passes again, it goes to Gov. Bev Purdue to sign into law, which she has indicated she will do. Congratulations and thanks to Equality North Carolina for all the incredible work leading up to this point. >More than a week after Rob Williams and Arnie States of KRXQ's “Rob, Arnie and Dawn in the Morning” seemed to welcome violence against transgender youth as part of an appaling hate-filled show, the show has finally gotten around to issuing a statement apologizing Sunday. GLAAD representatives spoke with the station manager today, and the show has agreed to bring on a transgender person and a parent of a transgender youth June 11. In more good news, thanks to the work of GLAAD, Huffington Post, Pam's House Blend, Perez Hilton and advocates like many of you, 11 advertisers have decided to pull their ads from the show. GLAAD has some great updates on the controversy here and a list of advertisers doing the right thing here (though it's missing the most recent, Guitar Center). SINCE THEN, YOU, OUR LOYAL LISTENERS, HAVE MADE IT CLEAR TO US THAT WE WENT TOO FAR. THE RESPONSE HAS BEEN OVERWHELMING. NONE OF YOU SAID THAT WE COULDN’T HAVE OPINIONS, YET SO MANY OF YOU SAID THAT THE WAY WE GAVE THEM CROSSED THE LINE. FURTHER, YOU SAID THAT OUR ATTEMPT TO MASK OUR COMMENTS AS “JOKES THAT WOULD BE UNDERSTOOD BY OUR AUDIENCE,” WAS UNACCEPTABLE. I WOULD SAY NOW THAT IT WAS WORSE THAN THAT, IT WAS COWARDLY. YOU HAVE MADE THAT CLEAR. THE WORD APOLOGY APPEARS NO WHERE IN THIS LETTER FOR A REASON. WE ALREADY HID FROM DOING THE RIGHT THING ONCE AND WE’RE NOT GOING TO MAKE THAT MISTAKE AGAIN. APOLOGIZING IN A WRITTEN, POSTED STATEMENT IS A FORM OF COWARDICE. WE WILL SAY WHAT NEEDS TO BE SAID THIS THURSDAY.ON A FINAL, PERSONAL NOTE, AS THE LEADER AND OWNER OF THE SHOW, I HAVE MADE THE DECISION THAT WE NEED TO REFRAIN FROM BROADCASTING NEW EPISODES UNTIL WE CAN ADDRESS THIS ON THURSDAY . WE WILL RETURN TO THE AIR AT 7:30 A.M. JUNE 11TH.